Happy New Year again! It may be 2012, but we still have to look at the last week of 2011's comics! Ready?? Teen Titans #4 - Teen Titans this month is tied for my favourite comic of the week! Really the team has finally started to come together in a way that's just fun and great to read! There's an excellent balance of characterization and action, everyone gets a cool moment, and (don't call me) Wonder Girl gets her second really amazing move in four issues! Not to mention the reinclusion and subsequent amusement value of Kid Flash! Plus we learn more about other new-to-me-at-least characters Bunker and Solstice, both of whom seem to have a lot of potential. 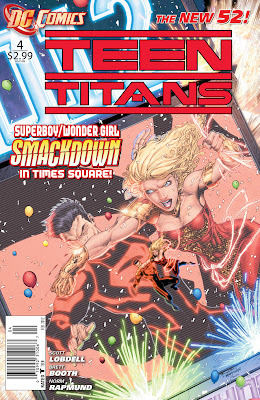 Superboy finally makes an appearance, working for his creators against the Titans - specifically against Wonder Girl, and of course, hi-jinxs ensue. Once again, I am left waiting impatiently for issue #5. So far, the only character I am NOT really feeling is "Skitter", the girl who accidentally turns into a bug. She's a little too emo "New Mutants" style for me. Regardless, a great issue in what is, so far at least, one of my favourite new monthly comics. Do I say that too often??? Aquaman #4 - DC Comics made a brilliant decision when they set the tone for the new Aquaman comic. Using the fact that no-one likes Aquaman and that he's basically the number one most ridiculed super-hero as a plot point is brilliant and hilarious! Who knew I would enjoy a comic about an underwater crusader so much? The sense of humour makes it awesome! 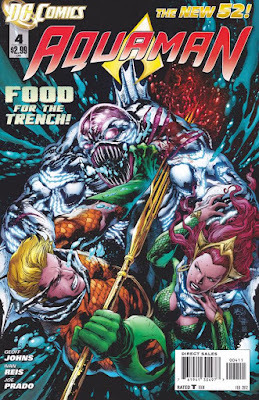 In this issue, we wrap up a four-part story about some hideous creatures that live underwater and eat humans and well, everything else too. It actually became a little tragic, and also laid some ground work for future issues. Hints of something bigger. I'm intrigued. However, it's not the plot, but the characterization that make this comic work for me in a big, bad way. Oh, and hooray for Aquadog! Too bad he can't swim. Like I said, tounge-in-cheek! Makes this book! 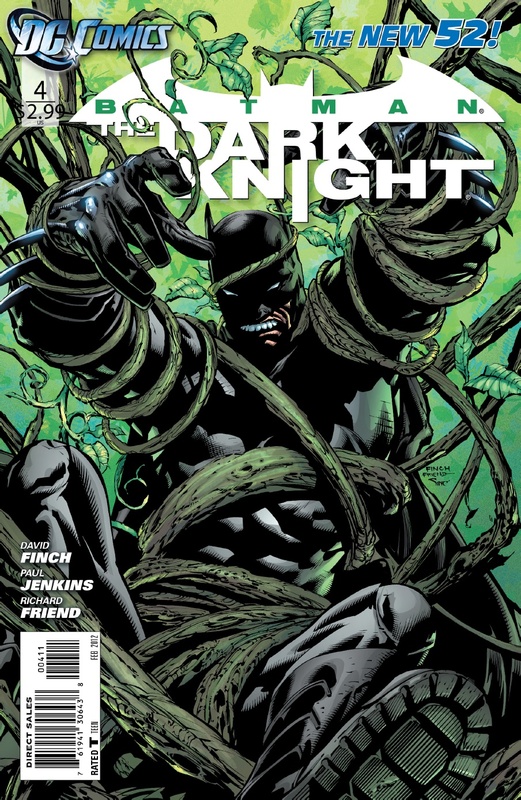 Batman The Dark Knight #4 - The Dark Knight has been an interesting monthly title. The story and artwork are a little more cartoony than in the other Batman titles and they seem to take something from the popular Arkham City video game. For example, there is a venom-like substance being used on various of Batman's foes to increase their strength and seemingly decrease their mental capacities. There's also been a lot of behind-the-scenes intrigue in this title as both Bruce and we the readers try to figure out just what the heck is going on around here?!? This month's issue gives us several more hints. Some pretty heavy exposition was counter-balanced with some breathtaking full page spreads. 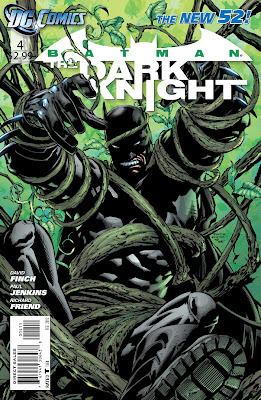 The artwork in TDK is probably my favourite of the Batman titles, although they are all great. In any case, a decent and very pretty issue to continue yet another chapter in the exhausting life of Gotham's dark protector. 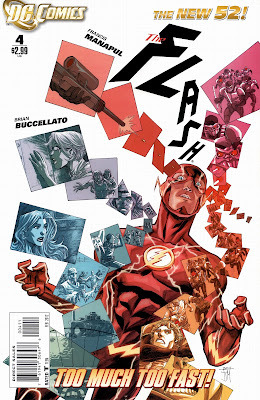 Flash #4 - Since the DC New 52 began, I've developed an ever increasing obsession with The Flash. He's just such a great character, sincere and almost childlike, but also incredibly smart and obviously very powerful. Most of all, Barry Allen cares. He cares about everyone and just doesn't want anyone to be hurt or even have a bad day. While I still rank Batman and Superman as my top two heroes, the World's Fastest Man has become my third favourite with ease, and the Flash comic, perhaps because it's so new to me, has become my most-anticipated book each month! Tied for my favourite for the week, Flash #4 does not disappoint! Oh, a word about the art - I think the artist here, Francis Manapul, is awesome. Not just for his pencils, although they are top-notch, but because his layouts are SO superb! There's a little three panel drawing in issue #4 that changes perspective in each panel until Manny's head bounces off the actual paper in a mock-3D way. It's hard to explain but just looks really great! There are tons of touches like that in The Flash and it really gives the book it's own personality amongst DC titles. If you're only going to buy one title from the new 52, you won't go wrong with The Flash! 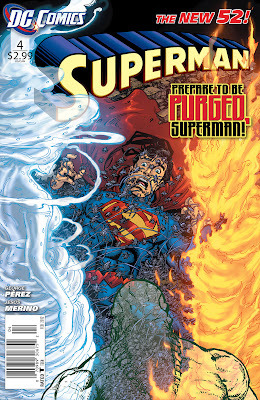 Superman #4 - Superman, as a title, has been a little weak in the last few months. 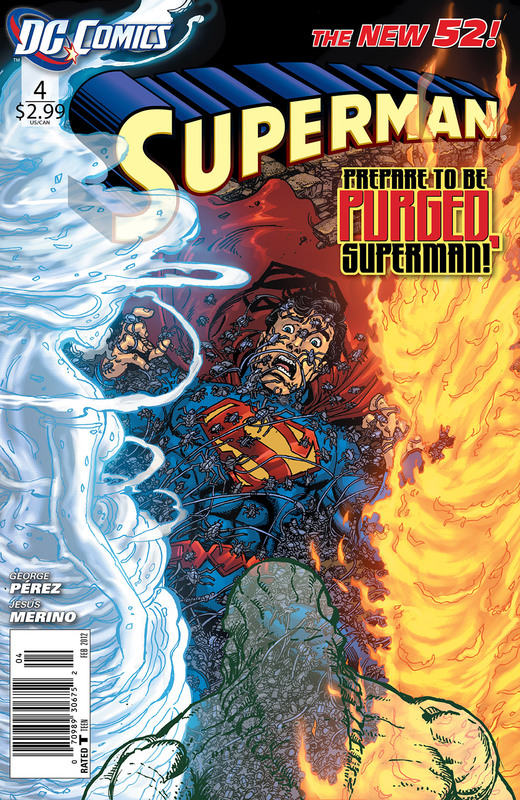 Particularly when compared to Action Comics. The artwork has been good but the series of weird aliens attacking for no apparent reason has started to get a little old. Also, starting a book with #1 and then having your main character be "not himself" and really get very little time to BE the main character has not, in my opinion, been the best move. Maybe I'm just not a fan of the brooding, emo Clark Kent. In Action Comics and even Justice League he's obviously having a lot more fun. Fortunately, it looks as though all this is starting to change, as these aliens that keep attacking our poor Man of Steel seem to be getting their act together and moving towards an end-game. The story that I was finding a little boring is in serious danger of picking up and getting really interesting and far reaching! We can hope, at least....this is definitely the best issue of the new Superman so far, but I still think that they can do much better. So that wraps up the week, the month and the YEAR! It's been fun! See you next week for the first comics of 2012!! !